Kolob Canyons is part of Zion National Park. It is found on the northwestern side of Zion National Park, and has an entirely separate entrance. Our family loves hiking in Kolob because it is significantly more quiet and has fewer people. 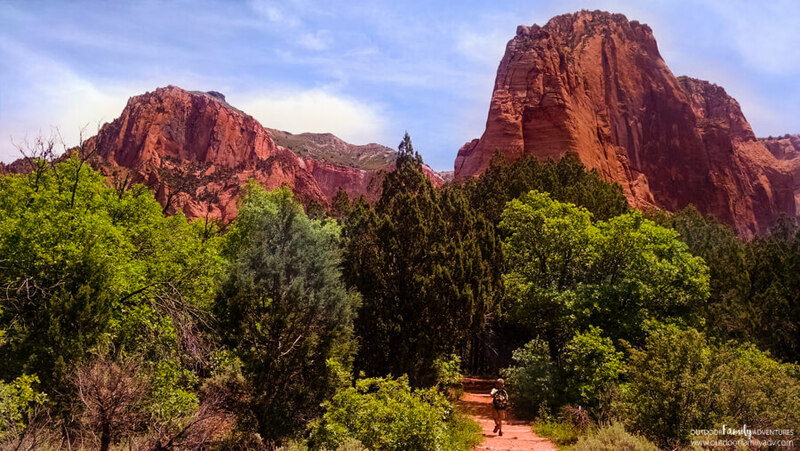 Most locals don’t even realize that Kolob Canyons is part of Zion (which means you can use your annual pass or interagency pass, if you have one!). Taylor Creek Trail is accessed on the left hand side of the road as you drive up the “red road” (as my kids call it). It will be your first full-sized parking lot on the left. There are no bathrooms at the trailhead so make sure you stop at the entrance of the park to use the facilities. There is also a small shop where you can purchase water if you need some extra. If you are going mid-summer, bring twice as much water as you think you need. Taylor Creek Trail starts by going down stairs. The stairs are easy to navigate, but they are a bit steep. My little 4-year-old was able to manage these on his own. The trail is very easy to follow, even when crossing the creek. The trail is clean, clear and I like that my little ones can decipher where to go next without me or the hubs having to guide them. There are a few spots that weren’t blatantly obvious, but that may have been due to a lack of focus when I’m corralling 4 kids. Plan on letting the kids explore. There is so much wildlife to see on this trail, you can’t pass up the chance to check it out. If you have older kids that are bored walking along the trail, they can actually stay in the creek and follow its path alongside you. You’ll end up criss-crossing each other and are always within “loud voices” distance. My 8-year-old couldn’t focus on anything else but catching toads, so he spent most of his time following the creek verses being on the trail. It is a longer path, but as long as they keep up, it’s a fun alternative. Like I said, wildlife for DAYS in Kolob Canyons! We stopped counting lizards around 30 and toads weren’t even something we tried to keep track of. We probably saw a hundred of them, no exaggeration. On our way back we did come across a rattlesnake in the brush right next to the trail. He wasn’t rattling and was simply minding his own business, but it’s important to know that there is the potential of seeing one on the trail. Especially if you are going to allow kids to run ahead of you; make sure you teach them how to properly handle a rattlesnake sighting. Here’s some tips on dealing with a rattlesnake. Although you walk under trees quite a bit, make sure to look up! There are some amazing views to be seen. 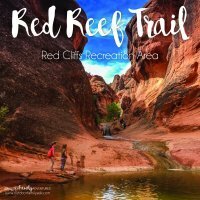 This trail really has everything – animals, bugs, shade, water and views! Another awesome part of this hike are the 2 historic homesteads (built in the 1930s) found along the trail. Since we have done this hike so often, the kids like to use them as trail markers. I suggest that if you want to start out slow on this hike, hike to the first cabin, then turn around. Next time try to make it to the second, and so on. This trail has so much to see and look at that it’s worth doing more than once, so don’t feel bad if you have to turn around and try again another day. There are multiple areas with stairs. This hike is not for someone who has knee issues. Granted the stairs aren’t difficult, BUT… it can be when on a 5-mile round-trip hike and there are a few sets, so just be prepared. Getting to the end is WORTH IT! At the end of the 2.5 miles, you will find yourself at the base of a double arch alcove. It is so cool! 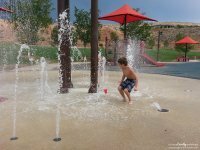 This is a great place to take a break, have some lunch, enjoy the cooler temps and let the kids explore. The coloring is amazing. These alcoves are a result of natural erosion in the Navajo sandstone. I didn’t have a wide-angle lens (just my trusty camera phone) so my pictures don’t do this area nearly the justice it deserves. 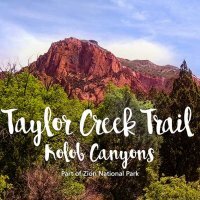 Taylor Creek Trail in Kolob Canyons is definitely a family favorite and one we will continue to venture out on. Ends with lots of stairs going up…lots…at the end…UGH! 30 miles north of St. George, Utah. Take exit 40 to Kolob Canyon Road (you’ll see the “red road”). 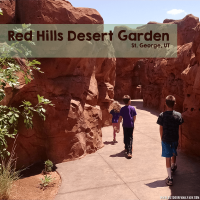 It is approximately a 30 minute drive from St. George, UT. Kolob Canyons is found close to New Harmony, Utah. 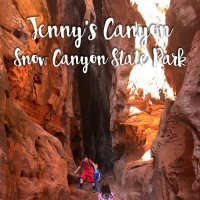 We’re headed to Zion with a 2 and 4 year old next month so happy to find this blog/post! Thanks so much for the extra info! We’re in southern az so its even hotter here….last week we had a few days of 115!